After a ton of very hard work, and lots of debates and decisions, we’re thrilled to be able to share the all new Basecamp with you. This has been a company-wide effort. Every designer, every programmer, every sys admin, and every support team member were involved in building this product. It’s completely new. Reimagined, rethought, and redesigned from the ground up. Everything was reconsidered. Every idea, every flow, every concept. Nothing was sacred – every idea and every feature had to fight for its place in this first version. The new Basecamp features an entirely new innovative interface. All new code. Brand new tech. And some serious hardware backing it all up. This is our best work. And it’s just the beginning. We have a lot of great ideas in store. But first we wanted to focus on the basics. Nailing the foundation so it’s strong and steady, easy and fast. In many ways, this is our second chance to make a first impression. For many of our customers, Basecamp was the first time they’d ever used a project management and collaboration tool. Most used email. Or the phone. Or lots of in-person meetings. 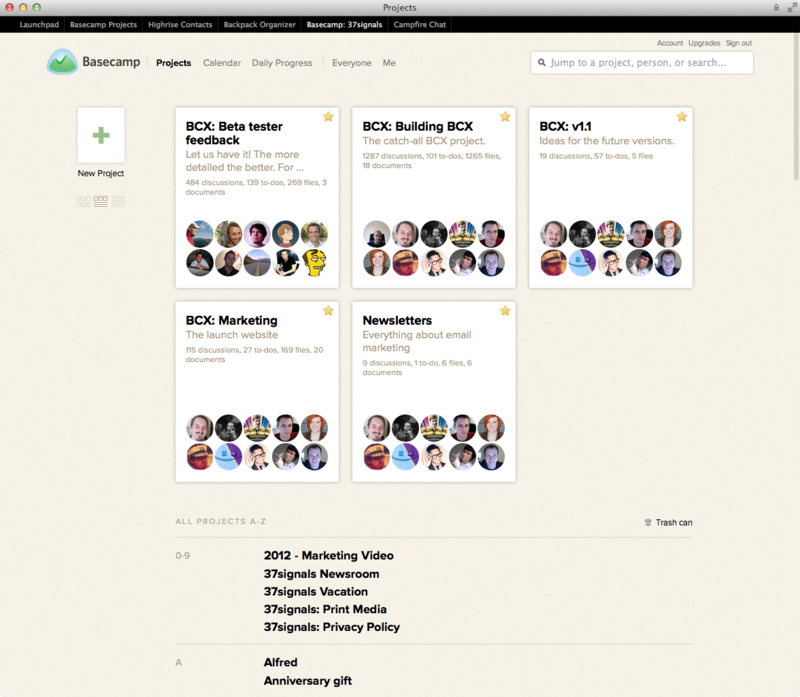 Basecamp was a whole new idea, something brand new, an opportunity to get organized and keep everything together. This new Basecamp is a return to our roots. It’s focused on the basics. It’s even simpler and clearer than before. It’s super fast. And it’s useful for a whole new group of projects – short projects. Most project are small and short. The original Basecamp was overkill for most kinds of projects. The new Basecamp is perfect for projects of every size. We think a whole new generation of customers will be introduced to a new way to manage their projects when they use the all new Basecamp. In addition to our own team, nearly 1000 people were part of the beta test program over the last few months. Our beta testers shared invaluable feedback with us. We’ve fixed a lot of things and cleaned up a bunch of dusty corners due to their involvement. Thank you so much. We’ve set up a few live online introductions to Basecamp this week. The first one is today (March 6, 2012) at noon. As they fill up we’ll add more, but if you’re interested I’d recommend getting in as soon as you can. Space is limited. Register today. We invite you to check it out. Everyone gets 45 days free with unlimited usage. You can create as many projects as you’d like and invite as many people as you want. As our way of saying thanks, current Basecamp customers who want to try the new Basecamp get 90 days free. Here are some FAQs for existing customers and here are the steps to copy your existing projects into the new Basecamp. Jason Fried wrote this on Mar 06 2012 There are 279 comments. Insanely awesome work guys and gals at 37Signals. I’m going to make the switch soon. I’ve been using Asana because the previous Basecamp had less of web app feel. Basecamp Next is exactly what I’ve been waiting for. Congrats to the 37signals team and the whole community. Excellent work guys! It looks great and I can’t wait to try it out! First: The new Basecamp looks and feels amazing. I really love how you took the “Sheet Design” to a new level with the border less input fields. But I couldn’t find the Free Tier in the Plans. Do you plan to introduce it again or is it gone forever? We’re absolutely loving it so far – very nice job guys. Our projects are in the process of transferring over now and, once that’s done, I doubt we’ll ever look back. Do you have any advice we can share with our clients as to ease the transition? I know one big thing will be the change in access URL – I assume that the new “basecamp.com/123456” scheme will replace the old “acme.basecamphq.com” approach, correct? Chrostoph, we’re trying things out without the free plan for a while. We’ve adjusted the Basic plan a bit, so we’re starting at $20/month. Also, no credit card needed for signup and 45 days of free, unlimited usage. Looks great and works great so far. I know how difficult it is to do second ‘first impression’, but you just did – congrats to the whole 37 Signals Team. Brandon, when you migrate over projects, customers can login using their existing username and password on basecamp.com/login. I’ve noticed that the concept of Milestones is gone – any plan to reintroduce, or are you strictly relying on To-Dos now? The new interface also doesn’t have a Webkit friendly render like the previous basecamphq.com did – planning on re-introducing? Aside from that, look good. Hey guys, reposting this here… nice work, looking good so far. Really enjoying the new UI/aesthetics. That said, is white labelling gone? Can’t find any way to get either our brand or company name to be prominent. Craik: Milestones are now called “events”. They aren’t the same, but they are very similar. 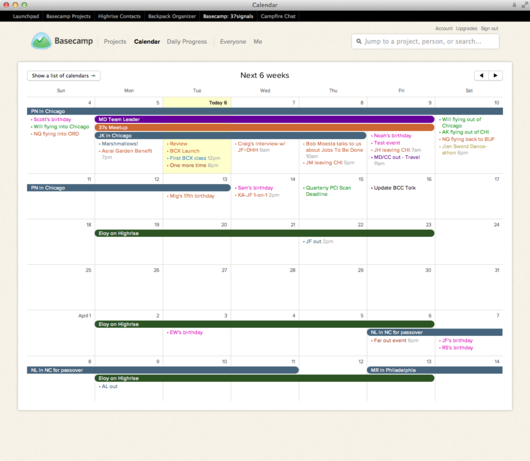 They’re viewed in list format in a project and in grid view on the calendar. As far as second first impressions, it’s a very memorable one. The entire experience feels light, easy, and inviting. Every aspect feels more considered than the previous, allowing the UI to make room for what I suspect will be an increase in productive collaboration. Excellent work to everyone involved. Gavin: No personalization at the start, but we have some ideas we’d like to explore down the road. We wanted to focus on a consistent experience for everyone in v1. You are very clear that classic and next exist at the same time and my projects can even keep going in both. What’s not super clear is what if I want to force the switch. I don’t want anyone entering anything into classic when the rest of us are working on next. Fantastic work, team, well done. We’ve been part of the beta testing and keen to try it on some live client projects now. Great work. Looks beautiful… But this is a major set backwards. No time management? Massive Project windows? List view? So many things wrong and I am have been a massive fan, until now! A little inside baseball, but are y’all using the H&FJ’s web font service to get Gotham? Kottke seems to think only he and Obama are beta-testing it, but you guys are using it all over the place. That or I can’t tell Gotham from… whatever you’re using. That’s entirely up to you. You decide if/when you want to make the complete switch. You can archive everything in Classic or even cancel that account if you don’t want to use it anymore. But that’s your call and you can do it on your own schedule. Or not do it at all, of course. Very nice user interface, but lacking time tracking is big problem for us. Also not being able to post items privately or save files privately is another item that will prevent us from switching. Otherwise, we really like the look and feel – but the lack of these important features is a deal breaker. Hopefully you will be able to create project templates at some time in the future as well – which is something that we use often. Awesome work, it’s a huge step forward. We’ve been using Basecamp Classic for almost 3 years and we can’t wait to move to the new Basecamp. However we’re currently missing 2 functions that we just can’t live without: Time tracking: being a web agency we use this both for cost tracking and for billing purposes, so obviously can’t live without it API: we use this with an advanced cost tracking and reporting tool we’ve built for ourselves. Have you decided whether you want to add these 2 to the new Basecamp? Thanks. So once the import is complete (I totally understand the delay right now) I just go into classic and archive the projects. Understood. I appreciate all the extra effort going into making such a huge change appear so smooth. Hey guys, is there a list somewhere of what classic projects will lose if brought into the new Basecamp? For example – I’ve seen time tracking didn’t make it and looks like milestones are a little different. The FAQ and steps to copy don’t seem to mention that, and it would make me a little more comfortable – especially as I’m looking to move everything over – to see what the ramifications are before spending the time doing it. The calendar and progress timelines look awesome! Rizwan, instead of private you may want to check out the all new loop-in feature which allows you to send things to people who don’t have access to the rest of the project. Jonathan, it explains this during the project import process, but we’ll also add it to the FAQ and get it posted today. Nailed it. Congrats on the launch – it’s an amazing piece of work. Any open source extractions coming out of BCX? 1) Is there a way to link to campfire directly for chat as I do from each project? 2) From the sample project, I did not see any categorization of files? Is that correct? There are so many things in the new basecamp that are amazing! The speed is probably the top 1 thing that will help the most. Drag & Drop files, real-time updates… awesome! It’s so sad I can’t implement this today! There’s no way I could do without time-tracking within my projects. It’s like a mirage in the desert…. so close, but can’t get to it. For those pining over the loss of time tracking, we’ve used Harvest for the last several months and have nothing but good things to say about it. Is there no mobile version? Apologies if this was answered already. Does the maximum project count only reference ‘active’ projects. Do archived or inactive projects count towards the total project count per the subscription plans? This is a brand new product right. You’re giving stats on Basecamp Classic, not Basecamp (Next) – which is a completely different code base / different UI / different features / different architecture. Another way to say it … How can you claim all of that when the product was just released 45 min ago? Albert, yes, it’s a brand-new version of our project management software. It’s not like Basecamp is now a tool for managing mink farms. It’s targeting exactly the same problem as before. We’re going a step beyond that by offering both the new version and the old version at the same time. Albert: When Honda releases a new Civic every few years, can they not say the Civic has been the best selling car in its segment for the last 10 years? Sure they can – it’s the continuation of the core principles and brand, but refreshed and redesigned. Today’s Porsche 911 doesn’t share a single part with the 911 from 10 years ago, yet it’s still the 911. And Porsche can still talk about the 911’s heritage, line, reliability, longevity, etc. Same with Basecamp. It’s still Basecamp. The core principles and promises are the same. It’s just a totally new version. John, we use Campfire side-by-side with Basecamp. There’s no specific integration between the two, though. We don’t have categories on anything yet, but we’d like to explore that in the future. The project limit is only counting active projects. DHH—thanks for the response regarding integrating Campfire chat room with Basecamp. I did like how under Classic I could have a separate chat tab that would take folks directly to the dedicated chat room link for a given project. I’m not sure how best to replicate that … so I can make it as easy as possible for folks to know how to find the right chat area. I guess I need to create a discussion that simply contains an appropriate URL to that dedicated chat room. Easy enough. (yes, I know I can add tags to descriptions of files so you got me there—I just prefer keeping it separate, that’s all). John: Yup, we’d like to explore a variety of tagging ideas down the road. We think we can do a lot better than categories. I like the car analogy. Now I “get” the side by side! This is one of the best software rollouts ever. Keep up the fanatastic work! Will it be possible to use Next as part of a Suite? E.g. Campfire, Backpack, Highrise, Basecamp Next, but no Basecamp Classic. Loving it so far. And holy moley is it fast. I too think it’s misleading to claim what stats from an old product. The Honda Civic example Jason gave isn’t a good analogy given you are trying to compare SaaS to an automobile while also selling both products (Classic & Next) at the same time. It’s be more appropriate to state on the frontpage that “Basecamp Classic” has those stats. I have a new client I want to use Basecamp Classic. Where do I point them to sign up and purchase the old product? Is it possible to email into a Project? Maybe I am missing the unique email address? Ideally, i would like to email in a To Do to that project (which I don’t think was possible in BaseCamp Classic). Any chance we can set the week start day to Monday, as it’s the norm in Norway (and Denmark too, David?)? Same goes for 24H time. We’re not using AM/PM up in Scandinavia! Other than that I love it! Does the Basic plan include time tracking? 23 reasons to use the new Basecamp eh. Any significance to there being 23?... maybe a tip of the hat to the greatest basketball player of all time? Bryan: I wish I could say it was for Jordan, but it’s really all we were able to get in for launch. There will be more once we have some spare time to produce those pages. Are Writeboards imported to the new Basecamp as Text Documents? I couldn’t find this listed specifically anywhere and didn’t want to assume. 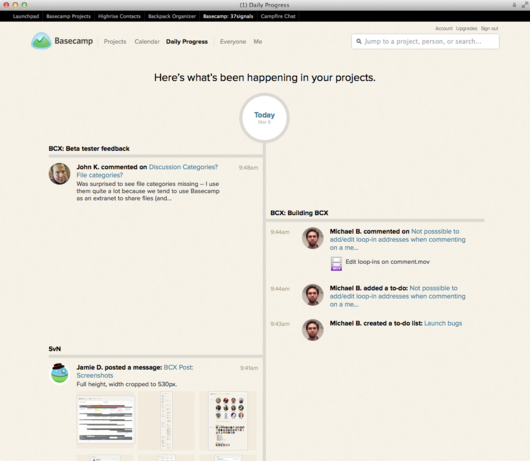 Facebook-style timeline for projects – genius! Grant: Yes, Writeboards are converted to Text Documents. John: The inspiration came from our about page, not Facebook. Imported projects over and in Basecamp Classic they were all archived. This is contrary to representation that everything would stay the same. When starting a Basecamp project from a Highrise deal, how can I get it to create the new project in Basecamp Next instead of Classic? I’m a very heavy user since basically day one. Information density on todo lists: On the old basecamp I can have 25-30 todo’s visible on a page at a time, on new basecamp I can only see around 15 max. It’s quite cumbersome. I liked textile and I find your new editor has some issues with pasting text oddly, inserting code, no nested lists, and other various issues. The plain text editor is one of my main reasons for using basecamp, I feel we should at least have the option to edit html of posts. Again though I really like the update and you guys are still the best in the business. Very nice, but we agree with Rizwan. No time tracking and no private posts are deal breakers for us. Are templates still around? I can’t seem to find them..
Loop-in is a different angle on “private” items. Instead of inviting people to projects and hiding things from them selectively (and making sure you don’t mess that up), you can just keep them out of the project and loop them in whenever there’s something you want to expressly share with them. We believe it’s ultimately a better model than the fragile private model. If you guys are doing away free version, how about consider offering 5 project for $10 or 2 project for $5 instead as beginner package? Ed: No plans to go below $20. We believe $20/month is a very fair price for what we’re offering. NO TIME TRACKING!? This is the most crucial thing we need in our business. Time = Money! I don’t understand how you can have a project management system and leave time tracking out. ? Everything else looks great, but we are going to be forced to hold off until we can track time on each product. That’s how we invoice our clients, and with multiple companies and contractors working on the same project we need to see where all the time is going. Using a 3rd party product that does not tie into Basecamp is out of the question. Just another unnecessary step for us. It seems like an easy add for you, since it’s most likely a simple relational database of user/project/time. PLEASE ADD BACK! Finally, what happens now if you start a new project via Highrise from a Deal? We follow this protocol to keep projects tied to our client cards on Highrise so we can easily jump from their profile to a previous or active project. I’d love to see a sort of “stream/status update” feature in Basecamp like there is in Backpack. Sometimes I just want to announce something unrelated that everyone can see if they so choose. Like a little twitter inside Basecamp. Arik, we have some ideas there we’re going to explore down the road. We just didn’t think it was important enough for v1. The interface is nice. Great work there. No reasonable small plan, ditching the free plan. I’m a solo shop with only a few projects going at a time and this leaves me high and dry. I’m definitely not paying $20/month. No time tracking is gonna hurt some of my clients. True bummer. Don’t forget, many of the small shops are tech influencers. Congratulations. Being able to say “This is our best work” is just awesome. Also, continued lack of any real integration with Highrise doesn’t work well for me either. Design is nice though. Basecamp is a pretty car you can’t really drive anywhere useful. JF. Please answer everyone’s concern over time tracking… Many users are going to avoid the new version of Basecamp if not resolved! This is a real shame. I image in hindsight, this product launch will be the worst idea 37signals ever had. @Gman I couldn’t agree more! @JF No reply… ? We’ve been loyal BC and HR customers for over 3 years and have almost 1,000 archived projects. It would be nice to have some support regarding our needs and concerns. We open an average of 1.3 projects a day. Perhaps our insight ‘should’ be valuable… ? Gman: There is no time tracking in the new Basecamp. There’s not much else we can say about it. We have to make calls about what makes it into the v1 and what doesn’t. Time tracking was only available to a portion of our customers before and only a portion of those used it. We wanted to make sure all the features in v1 of the all new Basecamp had mass appeal. That’s the decision we made and we’re comfortable with that decision. Today is day 1 of 1.0 of the new Basecamp. We have a lot of great ideas we’ll be exploring down the road. Time tracking may or may not be one of those – we haven’t made any decisions yet. It’s way too early. All our decisions so far have been about 1.0. Are we the only people who have a problem with the way Messages came over to the new product? I can’t figure out how they’re sorted, but certainly not in the order they used to be. We have projects that run for years, and now the first message on a given project site may be from 2006, the next from 2009, and I haven’t been able to find the newest stuff yet in some cases. I understand everything going forward will be right, but this is going to be tough (and tougher on the clients) if we can’t see the latest stuff right at the top. Anything we can do here? Other than that little issue, love it. The Loop In is fantastic. Great Work! We subscribed to the 37s Suite, but today we are just using Basecamp and Highrise. Of course we want to use Basecamp Next from now on, so we look for a Suite integration after the 90 day Trial :) We don’t need Classic Basecamp anymore. Next is More Easy… More Speed… More Projects :) Thanks. Wow! Congrats! Only one question besides time-trackig – what about translations? Is it already on your road-map or should I stick with Classic for a while? @DHH Wait, are you saying that BCX isn’t a tool for managing mink farms?!? What am I supposed to with all these minks, ...mink, ..........minki? I’d like to clarify the same question as Mike. As a Suite user can I eventually move from Basecamp Classic or will this be a separate charge to the Suite price? What is the upgrade cost if you are coming from Classic? @dave lundgren same problem with messages. i have been having a back and forth with support about it. The main problem is that ‘discussions’ in imported projects come in with most (but not all) of the messages with the import date and not the real date when viewed on the project overview page. When you click through to the message the correct date is there though. However this means that your project over view page – which is the first thing my disoriented clients will see – will be populated with old and out of sequence messages. This is a disaster for projects that have been going for a while. Awesome work! I love the subtle animations. Feels great. Did you guys use a particular open source js library for those animations? Thank you JF for your reply and that does make sense. However, it might be worth reviewing for 1.1, as most of those portions seem to be in this thread! Everyone will want to express their concerns, but overall, the concept and UX is far better than classic. Hey, New version looking great! Just started using it! But we miss the milestones concept too (read some comments abou this)!!! Milestones are differentt from events!!! Milestones need tasks or to-dos and work as a goal control. Events can be a meeting that does not depend on any to-dos! Please, think abou bringing the milestones concept back! Regards from the Brazilian Basecampers!!! simple, fast, clean. but REALLY missing milestones and the ability to see an overdue deadline and check these things off on the calendar. it’s keeping us on Classic for now..
Love it! Just finished importing all my projects and am excited to start tooling around. Quick question: In Classic, you could click on a user’s account and re-email them a note with login information. Any way to do that with BCX other than deleting and recreating accounts? Thanks for all of your team’s hard work and especially to JF and DHH for fielding questions in the comments thread. Service above and beyond, for sure! PS. $20 is an utter bargain if you’re doing client work, even for tiny shops: just roll it into a PM line item. Don’t let the cheapskate naysayers tell you different! Why have you gotten rid of categories for messages and files? We had entire workflows that relied on the categories, so now we need to find an alternative or redo the whole thing. If a project has 300 messages, don’t you think you might want to find only the messages applicable to a particular thing? Is your idea that projects should by default be smaller and more discrete? That would create many more projects, which would be accretive to your bottom line as people would have to up their plan limits. Loop-in is really not an acceptable substitute for private messages. For us, Basecamp is supposed to be a central repository for all project communication. We need to be able to keep internal communication in there as well, but still give clients general access as well. I can understand the argument for removing time-tracking. I can’t wrap my head around why you’ve removed private messages. Loop-in is not better then privacy, it is just another great feature, but still another. With privacy feature I can manage project in wich we’re talking with clients a lot (and they CREATE their discussions and todo-lists) and at the same time developers can be there and use private todo-lists for bugs and other things (like some discussions or files) that we don’t want to show to the client. That was very big deal for us and probably for tons of commercial web studios.. Are there any chances that we’ll have privacy back? p.s. Pulls instead of push — why? The simple approach to Time Tracking in Classic was just great and so very 37s. Systems like Harvest are too much. Oh, sorry, forgot to add my 20 cents about milestones. Todos attached to milestones was just great, and moving all milestones forward was awesome. So our company can leave without timetracking and categories (other hot topics here), but can’t without privacy and a little bit sad without milestones. Though I already moved practically all our projects to BCX, but will live with hope. What a bummer. This looks great, but there’s no way our business could switch without the time-tracking feature. Please reconsider the importance of this feature. Nathan, you can still do that. Click the Everyone link, then click the person, then you’ll see a notice if they haven’t acted on their invitation yet. If it’s not there then they did accept the invitation. One great “feature” in Classic is that actions are NOT logged by the minute (as a person working at odd hours…). This looks RAD! However… there is NO WAY I can completely move without time tracking. Also… EPIC FAIL in the import process. I lost all the times and dates that were attached to messages etc. When I have a project with hundreds of discussions and comments… how am I supposed to know which is the latest? Finally, I have to say that while everything certainly does LOOK a lot nicer and has tremendous potential for the future… its a bummer to feel like you have taken a step backwards with the initial release in terms of functionality. Ill keep an ear open, wait on classic, and hope for an update asap. Thanks for your efforts tho! Also… EPIC FAIL in the import process. I lost all the times and dates that were attached to messages etc. Yeah, will it be fixed on BCX, or better to go back on Classic for day or two and reimport when it will be ready? For all those people moaning about the $20 entry level plan—if your business cannot afford $240 a year (which will be tax deductable), then you ain’t doing it right. In the past, getting people to buy in to the concepts and processes in Basecamp was the biggest impediment to use by anyone at our organization other than me and one other person. Now, however, the system is so much simpler. The lack of features and functionality will save me a ton of time in envisioning how to extend our BC investment to all manner of projects and process management needs. Since it’s not really useful to us anymore, I’ll be able to devote my time to something more productive. Maybe I’ll redesign all our publications so that we no longer have departments or even headings. Those are definitely cumbersome from a design standpoint. People can just search now to see if an article contains any words they might be thinking would be relevant to them in their search for content. Brilliant! Roma, William, we should have a fix for the sorting problem shortly. Sorry about that! I find it strange you can’t decide whether to build in time tracking or work with other vendor to integrate the application so you did neither. Hi guys, nice looking work but you REALLY screwed the pooch in regards to Time Tracking. I sent a request back in January to consider adding one more drop-down menu to the “Create a Report” feature in Classic, as it’s now referred to. Besides being able to create a report by person (Show “John Doe’s Hours”) over a specific time period, we felt it would be very simple & helpful to be able to create a report by “Time Spent Across the Project” over a specific time period. This way we wouldn’t have to waste time breaking down the reports manually. As a loyal Basecamp member since November 2, 2005 (almost 6.5 years) I feel you’ve let us down. Please re-consider adding the aforementioned feature and I’ll remain a loyal customer. It’s a great work, however, it’s really sad that this version doesn’t support translates to our clients, since this was a main feature for me to comunicate with my clients… why you didn’t want to include that? it doesn’t make any sense to me. The second thing is the templates, they where really help full, now I would have to lost a lot of time adding the same tasks again and again. I don’t see where you answer the question about the suite pricing. I love bundled pricing an bought into it pay more and haven’t used the other pieces. So if I were to move to this new basecamp and it wasn’t in the suite I would likely just drop the suite and keep basecamp classic and the new basecamp and then if tolerable just the new basecamp. So my plan as of now is to be paying $20 a month instead of $100. So what I’m saying is that I want the new basecamp and the old in the suite. Should that cost $20 more a month. I don’t really care, I just want to pay one, all in, price and not have to think about it. That may seem arbitrary but when you have a bookkeeper its easier to just say the price went up. I also don’t see it mentioned if it’s all in the unified login if I add it. Does it show up in the header menu as another option? I read something here about no privacy? If so, what an odd choice. I didn’t really like the privacy feature before because I was always paranoid that it wasn’t private. Or that I would forget to mark it. So it could have been better separated, but haven’t it in a whole different project is not really effective. I haven’t looked at loop in yet, so I don’t know what that is about. In general, after reading the comments, I’m just irritated about how this was rolled out. About the removal of features and the separation from the existing product line. So add +1 to customers that are disgruntled and confused by this move. Congrats on the re-launch to the entire team. Great work, I am sure it will turn out to be well worth the effort (and risks). Excited about the updates here, but can’t upgrade without the inclusion of Time Tracking. If it is added in v2, please post a message to Basecamp Classic, so it’s seen. We’re all eager to switch. Thanks! If you want time tracking, continue using Basecamp Classic. I think JF and DHH have made that fairly clear. Classic is still great software and if it’s working for you, then why switch right now? Trevor, the new Basecamp is free to suite users. You get 50% of your suite value against a new Basecamp plan. So if you’re on the $99 suite, you get the 40-project plan for free. $149, the 100-project plan. $249, the unlimited plan. You can upgrade from your account screen and the discount is automatically applied. Sorry that you didn’t like the roll-out. We’ve tried hard to make it as optional and pain free as possible. Most hosted software will just force a new version on you. We’re letting you upgrade (or not) on your own schedule. Looks lovely, well done guys, but a couple of initial questions. Has track changes been completely lost on the text documents? Accessing via my phone seems to show there’s no mobile optimisation whatsoever. Really, is this right, you’ve built and new product from scratch and haven’t considered access via phones or other small screen usage?! I was really hoping Next would make it easier to move things from project to project, but, as far as I can tell, we can’t do that at all at the moment. I understand why you wouldn’t want people moving things while importing projects, but it would be great if you make it easier for us to reorganize projects. We’ve been using Basecamp for a few years now and we’ve always been HUGE fans. We work on very large projects with users around the world. We’ve always felt that 37signals’ design philosophy was based upon the “Keep it simple” principle while simultaneously offering VERY robust capabilities—sorta like us. So today’s news came as a little bit of a shock. I’m trying to remain upbeat and positive, but I’m not sure that we’ll be able to use the new version at all at this point. DEALBREAKERS: We’re hopeful that 37signlas will rethink these and get them back in there pronto (preferably before the free 90-day trial is over for Classic customers). -Someone said that there will not be an API for the new version. This makes me wonder whether all of our third-party Basecamp tools are now going to work. And how much time it’s going to take me and my team to investigate that, identify alternatives, handle change management and communication, etc. -Messages being imported out of order or without time/date stamp. Trying to stay optimistic about this, but I fear that this will be a nightmare for currently active projects. OTHER ISSUES: The following issues are REALLY annoying, but we can work around them if needed. It’s just a bit frustrating that there are so many issues. All in all, I fear that 37signals has decided to “throw the baby out with the bath water” and has really missed a few key features that are important to some of its current customers. Plus, this leaves me feeling very uneasy about my future relationship with Basecamp and whether it can continue to grow with us OR whether I should start shopping around for a different project management and collaboration suite that will continue to work for us a few years down the road. However, I have a lot of faith in the folks over at 37signals, so I’m hopeful that some of these features will be added back in and some of the other issues will be resolved if enough of us ask for them. Congrats on the new launch, but please keep the lines of communication open so we know that you’re listening. And please remember that your decisions about this product affect our businesses, our clients and our profits in very real and measurable ways. We need you to make US look good and if these features are not going to be available in future versions of Basecamp, we need to know SOON so we can all make strategic decisions about our own businesses. Thanks in advance! Hi Basecamp team, Just a quick note to say Gosh, am I impressed! No doubt some kinks out there, but overall what a great update – in-fact it feels like an old-new friend. Well done! Your UX rules and you’re an inspiration. I never doubted that you guys would nail UI, memory consumption/caching, performance and general design aesthetic. I’ve been a fan and user since the very early days. You guys are a class act and you pull no punches. You’ve always designed with “simple” in mind for the lion share of your users; good for you for sticking to your guns. My very personal opinion is that I consider Basecamp Next a step backward for creative agencies like mine. I tend to agree with those above who feel alienated and frustrated with this deployment, but I’m pretty sure Jason and David very much anticipated it and are OK with it. That said, we’ve been building PM+ software to scratch our itch and now that we see the direction the new Basecamp is heading, it’s full steam ahead. Good luck JF, DHH and the rest of the team and thanks so much for all of your hard work and inspiration over the years! This is really nice new interface of BaseCamp. Thank you guys a lot for your hardwork. This is a pretty product but hard to use. We use Basecamp for the time tracking function… We are testing out the suite right now, but if the move is away from time tracking, then I think we are simply going to jump ship and get rid of the entire suite… Does anyone recommend something else? OK so there is good and bad. The design and UI is awesome. I especially like the flow and speed. But even though I dont use time tracking many people do and its probably going to be a deal breaker for some. As for the private feature thats a huge deal breaker for me. I use private to-do’s on every project like a task manager or ticketing system using to-do templates. There is no way I can make these to-do’s viewable to the client. That just makes no sense. I also use private messages to keep track of logins and passwords for the project. Looking in the project for logins is easier than trying to find logins somewhere else. I also use private writboards to jot down ideas. I like the notebook feature and that would work for logins but it’s not private either. Another example of the need for the private feature is when a designer posts a new concept that needs to be reviewed and approved before being published. Private files are needed too. I upload a backup of the completed site to basecamp in a zip right after launch to have another original backup source just in case. PSD’s also cant be uploaded if I dont wan’t the client to get the PSD until they pay. Ok anyways I know this is version 1.0 of the new basecamp and there are going to be great things to come but I feel your loyal customers need to know if you plan to completely abandon these features or not. I’m not asking for timelines or if you will implement new features. I and many others are wondering if you plan to support some of the very important features that are currently available on the classic product. There are always people that will say if you need the features that are available on the classic product just stay there. That will be a hard sell since they wont be focused on the classic product to make it better, just to continue support. @37signals do you have any ideas to store private logins on the new basecamp. Pretty new project, but lacking in a lot of the core functions that we’ve come to use and love in the old basecamp. For us it’s Templates, private messaging and integration with 3rd party apps that is the deal breakers. That said – thank you very much for not forcing this upgrade on us. We had looked at wrike and a few other PM tools in comparison to basecamp and glad that we don’t need to look around yet. Hope that you can sort out these missing features from the old version. You have pushed your usability skills to the limits. Some header fonts look pale, but generally it looks gorgeous. The new basecamp has plenty of features, that make it really stand out from the crowd. Do you think you went away from your rule to keep things simple? Or it just evolved by adding a lot of features but in a simple interface? @Trevor: I gotta backup 37signals on this. You don’t have to switch to new Basecamp. They’ve said many, many times…very clearly and explicitly…that they will keep old Basecamp alive and functioning for years to come. In fact that would be my response to anyone who has “deal breaker” features (or lack thereof). You don’t have to switch. I can’t think of a better way to roll out a major change to software. “Here’s this brand new thing that we think is superior. But hey, if you don’t agree…don’t use it. Use the old thing.” Very cool. @37signals: The big question mark, I think, is for suite users. Got your message above about pricing. But functionally…if I upgraded and then closed down my old Basecamp (which frankly, I’m not sure how I’d do that, as a Suite user), will this Basecamp become the default Basecamp in my Suite? Start projects from Highrise deals and all that. I’m not sure what percentage we Suite users make up, but addressing that in tomorrow’s announcement might be good. Or maybe an FAQ just for us? I don’t know. Overall, love the new design. Far superior to an already fantastic product. How long has the new basecamp been under development? Would love to see a spec list of the hardware/software stack running behind the scenes to keep all our projects going. Are you running on AWS? Bring us PRIVACY to new basecamp please! @Dan I understand that we have the choice to keep the old Basecamp but 37Signals made it clear that their focus will be on the new Basecamp not the Legacy (Classic) product. I Love the new design, speed, UI and allot of other things but it’s just not usable for me and many others due to the lack of features. This comes to the point that I want to use the new UI and cant. That just makes me sad but it will make others upset. I would of kept the name Basecamp Next and made it clear that they are rolling out a new product that will eventually replace Basecamp. New features will be added over time. Try Basecamp next and when the features you need are added make the switch. Until then keep using Basecamp. Even those slight changes in words would keep the masses happy and anxious for the new product. First of all – nice piece of design. Clear interface, but sadly not as simple as previous. Power of Basecamp was simplicity. Simplicity in Next is a bit too abstract and hidden which will make people not easily adapt to it. E.g. yellow notepad with lines, do we really need that? If this was the first version of Basecamp, it would have less than a half of success the previous one had. Sure, the user interface looks sleeker. But that has never been an issue. Functionality looks to be much less! No time registration, privatize information, templates and more. Happy to read I am not the only one that sees this as a deal-breaker. Seems 37Signals chooses for the mass instead of business process directions. You might get more users, but they will pay less and show no commitment! Since we do not believe you will maintain 2 versions for long, we will have to investigate the (many good) alternatives available. 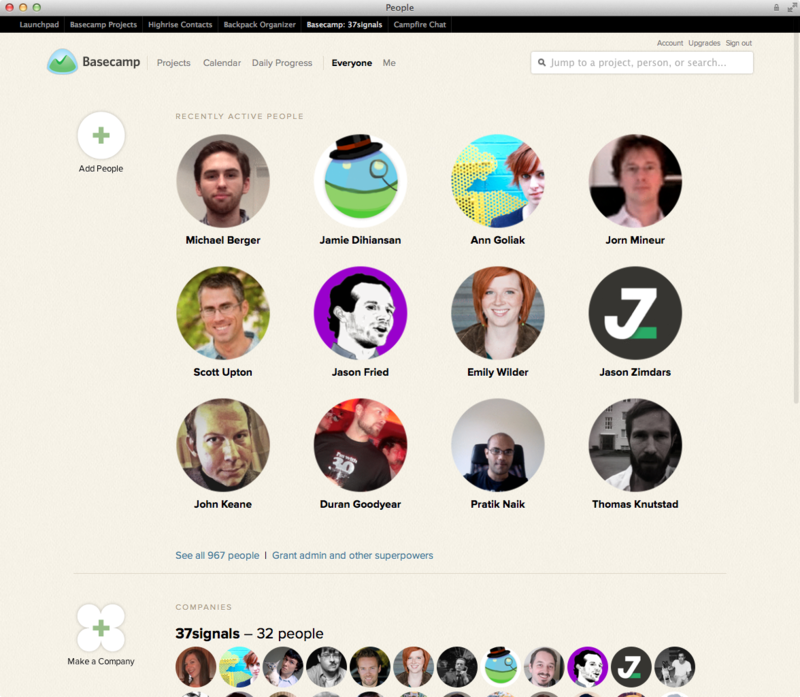 If basecamp is as important for your organization as it is for ours, I advice all to do same. A question about the free Basecamp for Suite users. I created a new Basecamp account from the Suite but it is marked as trial account. Why? Such a great product. You guys are amazingly smart. Thank you. Quick ?. Do you plan on allowing the project To-Dos in the calendar. So I can see a birds eye of what I need to get done that day. Thanks again for such a cool product. really love the new product. But still, like many others, we need some features of the classic product and i wouldn’t mind using third party tools. So will there be an API or not, i guess thats what most users want to know. Totaly lacks any cross-project features (except, perhaps, calendar). No way to view everyone’s tasks in all projects. That is really a showstopper for us. New UI is nice, but there is no big speed improvements seen from Russia (no CDN / Europe hosting i guess). And some new screens are just useless for our way of work. Congrats guys! I see a lot of interesting design decisions here (those hard ones…). One question: have you ever consider renaming old “Writeboards” to Notes (instead of Text documents). Both visually and functionally it really looks like my iPhone Notes app. I was really excited about this announcement – until I saw that private messages are not allowed. Loop-in is not an alternative – we need to be able to fully collaborate with our clients, whilst keeping some project-related information from them. The only way I can see to do this in New Basecamp is to have two basecamp projects for each actual project. I hope you’ll listen to some of the feedback from your users here – private messages are important. Is there anyway that I can remove permission from a sub user to see the EVERYONE tab. I don’t want my users being able to remove people from Companies are add people. HELP! I think You have overlooked 1 migration to the new basecamp.com scenario, which is disastrous to me. You have stated, that after the migration, I could keep working on the basecamphq.com as always. But I can’t. // Welcome to your Basecamp // Create your first project // // Disabled projects // Name-of-my-project // These projects are disabled because you downgraded to the single project plan. They will be restored if you upgrade your account to a plan that allows more projects. Before data migration, I was managing 1 project. Not 2, not 3, but one project and now it is disabled and I am asked to create “my first project”. Everything I managed before – now is disabled. I can’t seem to find the api tokens in web interface, is it still available? This version has corrected the single biggest annoyance of the “classic” Basecamp : speed, especially for users with a slow connexion. I’ve had it tested by my employees in China, who have always been suffering from extraordinary slow response times from the classic Basecamp, and it’s a blast. Stability is still to be improved though. For example, I was unable to log in as a new user through the email invite… The link in the email was refused by Basecamp’s server as an invalid/outdated URL, until I finally tried to receive the email in Thunderbird rather than in the webmail of my email provider, and then the exact same link did work properly. I guess the email may have too much structure to be properly displayed by this particular webmail service, and this is clearly something to be solved. Congrats to 37signals. Admire your courage here. Try not to let a siege mentality creep in. Wow… We’re also having problems with the sorting. We have several projects that have been running in classic for several years. All discussions seems to have a “random” date / sort after the import. The customers are all over us already. Hope u can fix it soon! PS: Will I need to contact anyone about this or will you fix this for all projects without me doing anything specific? Also: As a manager of my business? Where did the “total to-do list” with to-dos for all active projects go? I used that list daily for getting an overview of the remaining tasks for each employee. Right now I’ll have to click through all 40 projects… = nogo. Yeah, agreed! That was very helpful to overview PLANS, not facts (like with new daily progress). We recently upgraded and my first thought is that it’s design over function. It’s too simple. The font is big and blurry, you get less info on screen than before, it’s harder to tell stuff apart, everything is black on white, there’s no visual distinction between my own todos and the todos of other people etc. etc. The “Everyone” tab is the most dissapointing “feature”. Wtf is it? A bunch of avatars? Who could possibly have any use in seeing who has been active on projects recently? Why isn’t it an overview over the latests discussions, files, todos etc.? The new editor is nice. The old one was pretty much the worst editor available anywhere so this is a very nice upgrade. Haven’t tested it enough to comment on the other features. A question for all those who can’t praise the new BaseCamp enough. Did you really use the old BaseCamp? Could you explain your workflow for how you managed several projects, people and deal with for example “private notes” for a project? And when you praise 37Signals now, how is your workflow in the new version? You can’t even use the new basecamp without having the latest browser? That’s not good. That means probably half our customers can’t use it anymore. I tested it in IE6, 7 and 8 now and 6 and 7 just renders a blank page while 8 demands that you upgrade your browser, which most of our customers can’t do themselves anyway. At least show the upgrade prompt in 6 and 7 if you’re not going to support them. We’ll be adding some nice global views down the road. They just didn’t make it into v1. We’ve got a lot of great stuff planned. The new Basecamp is going to get better every day. Templates, templates, templates and private messages… they are very useful. My first impressions were very positive but in the end I have to agree with Tomasz above. If this was your first product you wouldn’t be near the success that Classic made you guys. I think this mainly stems from the drastic change in navigation – whereas Classic is very clear and light, the navigation in New is convoluted by comparison. For example, when I click on To-Dos there’s no way to directly jump to, say, Text Documents or Calendars when I’m inside. To do that you first have to return to the main screen by clicking the project name and then go into Text Documents. One click too many and that adds up to a ton over the course of a year of projects. Have you ever used Rule? This reminds me more of Rule with all the freaking clicks and less of Classic and that’s not a good thing. Its just unnecessary and even though New may be faster under the hood, missing the basics on something as simple as navigation makes it feel slower to me. Some positives for me functionality wise were improvements to the Text Documents and Calendar. Writeboards were never approachable for my customers so I dig the new approach. I would kill to have Text Documents in Classic. I use Basecamp for a lot of customer support and having the personalisation with company logos in Basecamp Classic is important for me so I’m looking forward to you addressing that. I am a paying customer but sometimes I just flatout don’t need it for the month – in Classic I can just archive my projects, downgrade to free, and keep sailing. I have to have that option in New or I’ll never make the change. I feel like this was just a classic case of there being so much success that you just couldn’t stand it and had to do something new, its a downfall of creatives. I would have rather seen 37signals add something like Wikis to Classic, freshen up the UI, and make the mobile version more robust. The bad sorting on imported discussions seems to be resolved for me—happened sometime in the past 8 hours, I think. Thankfully it just got fixed with no action needed on my part. I was worried I’d have to re-import everything. I haven’t tried importing a project since then. I’m still holding off on the important ones. The lack of privacy is a huge issue and a deal breaker for me. Because of the lack of privacy, when I imported all of my projects to the new Basecamp, anything marked as private was not imported. There is important data in private messages and writeboards. Now I’d have to go through project by project (over 50 projects) and find which private messages I need and manually copy the text over to the new Basecamp. I agree with the requests to bring back private messages. That was actually useful. I also miss the ability to jump to another project through a drop-down list (“switch to another project” in the Classic interface). I use writeboards as a handy way to export clean HTML to plug into a website or prototype once all the revisions are done. With text documents, that’s gone. I guess we can keep using writeboards separately, though, so it’s not a deal-breaker. There is definitely a recurring theme regarding time tracking and private messages – how is it possible to have a project management system that doesn’t record time when time is what underpins everything in our projects. Am a big fan of 37 Signals products but I am baffled by this glaring omission. The lack of an API is also a killer punch as many user will have developed their own systems to integrate with Basecamp and obviously third party companies who have built products to integrate with Basecamp are going to see their revenue streams diminish I would imagine. For our part we use Basecamp every day. We will certainly be sticking with the Classic flavour until such time as time tracking and private messaging is incorporated into the a future release. While I really appreciate all the hard work that’s gone into making the new Basecamp, I can’t imagine how our studio could use Basecamp as successfully without private messages. We collaborate with clients as well as other small studios on nearly every project, so private messages are critical. The loop-in concept doesn’t quite work in the same way. Time tracking was something we also used heavily in Basecamp. We could use something else, though it would be another step in another program, which is cumbersome. I realize that these were intentionally eliminated, but, as a result of the number of people who have flagged these as issues, I’m hoping that the new Basecamp will one day incorporate these features again. I like the new system too, but the lack of private messages is a problem. I can deal without them going forward, but I cannot lose all of them from the past 6 years. That’s crazy. Also, the self hosted FTP files are not migrated. We switched to using your servers for files awhile ago, but we have 5 years of files that will not be linked. In the end, you could solve my issues if I can maintain access to all my archived classic projects and switch over to the new system for active projects without having to pay for both systems. Is that possible? We’ve fixed the sorting problem of messages from imported projects. The fix has been automatically applied to all existing imports. We’re finalizing the new API. It’s not compatible with the old API (since the two versions are too different for that to work), but it’ll be available for 3rd party application creators shortly. For private, there are currently two paths: Either use the new loop-in feature or to use two projects (one with the public information, one with the private). We’ll implement moving between projects shortly such that the latter approach is easier to do. For seeing todos across a project, you can go to a person via the Everyone screen and see all todos assigned to them across all projects. We’ll also get some better global views in. Roma, there’s a link at the bottom of all email notifications to unsubscribe from a message. All in all, we’ve just gotten started with the new Basecamp. There is so much more to come. New features, better views, everything. We’re off to a great start, but it’s obviously not there yet for everyone. We’ll be working hard to make Basecamp a great solution for both new customers and existing customers. Were private messages a bad feature, or did they just not fit into your technical architecture (Russian Doll). That would be too bad if tech drove features. Another vote for privacy to come back. We keep archive files, notes between ourselves that the clients don’t see, all kinds of stuff. It would be a real headache to have to come up with a workaround on this. On the other hand, thanks for straightening out the imported message sorting! Time tracking is essential. Love the ideas that are being explored on the new Basecamp and hope some polish and additions will arrive in the next 30-45 days. Like the look of this, but without the private feature there’s no way i would want to add clients to it, and having two projects isn’t practical. The loop-in feature just doesn’t work the same way. Seems like you could have easily avoided all of these complaints if you simply called this new product something different than “Basecamp”. So far the new Basecamp looks and works great, as with others I’ve got so used to the Private feature that I’m unwilling to amend the workflow that previously made so much sense. As such I’ll have to stick with the classic version of Basecamp. I appreciate the Loop In feature is useful, and can see how I’d use that but I need my clients (and their stakeholders/superiors) to have access to the project without me looping them into 90% of messages. I also need Private To Do’s but Public ones for my requests from clients. Without running two projects this doesn’t seem possible. I’m curious how your beta testers managed and what they did to work around this feature / how them amended their workflow? I’ve been a Basecamp (and full suite) user for years, and am very familiar with what happens when new versions, especially sweeping new versions come out. I appreciate that you have allowed “classic” to remain while our current projects run their course. I’ve started building a fresh project, as well as imported an older non-critical project into the new system. I will say that I do like the general UI of the new version. It seems there have been some very good, and long overdue improvements. I don’t think I will be able to make the shift at this time however. There are simply key pieces of Basecamp that I use all the time which are not represented in the new version. Jason, I know that you keep saying that some of these items will be rolled out in upcoming versions, however, unless those versions start rolling out in the next 90 days, my “trial” is up. I think that some extended period should be available to long time legacy customers. I think that is why people are asking roadmap questions. Unless we know what some of the 90 day goals are, it is impossible to know whether to crossgrade, stay, or solve our own problems. I am a huge Basecamp fan and promoter, however, I cannot see the current 1.0 version being useful for us. As I imagine that the classic version will eventually be phased out, we will migrate out of Basecamp, but I look forward to checking back in as the new incarnation grows. -White Label, look customization: Not simply having my logo present, but by including a client logo on the project overview page, we were able to give an added feeling of indivual attention and strength. A minor component of this is the loss of a named URL. I understand that 37Signals is providing SaaS, however you should understand that we then provide SaaS to our clients, and now our branding ability is gone. Private Items: I see from the comments this is beaten to death. JF, I would only say that it seems you are not understanding how people use this tool. By making a list private, I was able to have a team instantly see, and add private items. The loop in function is AWESOME. But different. I need private items. Templates: This is a massive deal breaker for me. Maybe we are an anomaly. I have just completed a run of over 50 television programs that each had a basecamp project, each with an almost identiacl structure. The template prepopulated my calendars and everything else, saving me HOURS of set up. Also To Do templates. I’d venture to guess that most users have at least some repetitive TODO lists. Time Tracking: Jeez, beat to death in the comments, so simply saying +1. Overall- I think the UI is friendly, and probably a bit more tablet ready. Maybe you will attract some more of the entry market. I look forward to seeing what you make of it. I resent the upcoming effort I face in de-camping. I know that your argument is that the classic is still live and available. In my experience, it is rare for two product lines to continue to receive support and I assume that all development efforts are (rightly so) pointed at the new Basecamp. Good for you in the long term, terrible for me in the short term. I was about to start migrating 1 or 2 projects until I saw that the privacy feature is not available in the new version. Private message, files, to-dos are crucial to what we do and we communicate. I cannot separate a project for one group of people (clients) and another (our team). We encourage our clients to communicate with us and be involved in the project through basecamp throughout the process with messages especially. No privacy is real deal-breaker. I won’t be switching until that is put back in place. For private, there are currently two paths: [...] or to use two projects (one with the public information, one with the private). I’m with Ian a few comments above. This is Basecamp Lite. I understand it is V1 of V2 but removing critical functionality for those of us that have dozens or hundreds of projects and clients makes this a downgrade. I had moved two projects over but reactivated them in classic. I was a Basecamp fan. In fact, I even attended your Building Basecamp workshop in SF. I think you’ve left your client business and have forgotten what the needs were when you had it. PS. The new Basecamp is very pretty to look at. Is there anyway that the Suite users could keep both classic and new for the same price? I need access to my archived history of projects, but I can probably change my processes to make Next work. It is a deal breaker if I lose all this history. Another option would be to allow us to import private massages with a warning that they are no longer private. At least I would have them. I agree. Loosing years of private messages is unacceptable. They need to be migrated in some fashion. Being able to reference decisions (that were private) in old projects is 100% necessary. Seems like we are all saying the same thing. Private messages are a necessity. Build to the customer. I’m feeling simultaneously better and worse today after reading comments from other posters here this morning…better because misery loves company and worse because I keep hearing more things that have me alarmed. -“Were private messages a bad feature, or did they just not fit into your technical architecture (Russian Doll). That would be too bad if tech drove features.” YES, I TOTALLY AGREE! -Someone mentioned that it’s ridiculous that 37signals is proposing that we all invest in a tool that could cost us an additional $50-100 to handle time tracking (Harvest). 37signals, can you please check with your hundreds of beta testers and communicate 2-3 specific options OTHER than Harvest? -“I’m curious how your beta testers managed and what they did to work around this feature / how them amended their workflow?” I HAVE THE SAME EXACT QUESTION. 37signals, send us specific workarounds or assumptions that you made about this so we don’t have to reinvent the wheel. If you’re going this direction, we’d really appreciate SPECIFIC recommendations/suggestions that aren’t going to cost us all more $ and time to figure out within the next month or two. ”@Dan I understand that we have the choice to keep the old Basecamp but 37Signals made it clear that their focus will be on the new Basecamp not the Legacy (Classic) product. I Love the new design, speed, UI and allot of other things but it’s just not usable for me and many others due to the lack of features. This comes to the point that I want to use the new UI and cant. That just makes me sad but it will make others upset.” I COMPLETELY AGREE. Dan and other folks-if Basecamp Classic is a legacy product, the 37signals team will not to be introducing ANY new features or spending any of their R&D hours on it. Effective yesterday, it’s a dead product that will not keep up with the times. Just because 37signals will continue supporting it doesn’t mean that it will change or improve as technology or the business world changes. Ultimately, I feel that 37signals would have been able to launch this product MUCH more successfully if they called it “Basecamp LITE” or “Basecamp BASIC”. And I can’t, for the life of me, figure out why 37signals would take away so much functionality when there were so many other design studios, agencies, etc. involved in their beta testing. It doesn’t make any sense!!! If they want to target small businesses and one-man shops, I guess that’s their prerogative-but I will be curious to see how their balance sheet looks in a year when half of those smaller companies are out of business or out of $. However, I’m mostly disappointed at the impact that this is going to have on my business, unless some of the old features are brought back ASAP (like this week!). Otherwise, looks like I need to clear an extra 10+ hours in my schedule every week for the next two months to assess new tools, determine workarounds and communicate changes to my internal team and clients. We can’t even do a pilot test because if we import our new projects, it won’t sync with the old one and I don’t know if we’ll be able to RE-import them again later. Sure, we can probably figure all of that out if we have to….but I’d personally rather eat dirt. And I’m incredibly bummed that our old workflow and processes-which were working beautifully!—now need to be redefined again, possibly without Basecamp. 37signals, love you guys—but we need more transparency and better (more proactive) communication. And a sincere apology might help too, to alleviate some of the frustration that many of us are feeling. Please let us know that you are listening, so we can wait patiently for your updates. Thanks in advance! My biggest concern is the lack of mobile browser (iPhone) support for the new one. Unless I’m totally missing it. The absence of templates would for us carry a productivity/quality impact, whilst it is also disappointing that ‘white-label’ branding has disappeared. This has of course been a trend over the years from the completely white-label version originally, to then adding in the Basecamp name in the URL, the footer, notification emails etc. This is understandable from a 37S perspective, but from ours it it has progressively removed some of our brand consistency in what is a core interface for our company’s clients. Overall, my felling is of being a little let down today. This reflects the way my company uses the product for our industry (consulting) and I can understand others being extremely positive if they work in different ways. I look forward to learning more about the proposals for time tracking (without subscriptions elsewhere), templates, privacy and branding. Was your calendar UI written from scratch or did you leverage an existing library? @Lisa, It’s version 1 of the new Basecamp. No software launch is perfect on day 1. Actually there isn’t anything on this planet that is perfect on a day one launch. I get that you’re not happy with the new Basecamp. But I don’t understand why you feel you must berate 37signals for moving forward considering they have not cannibalized your old workflow. Literally nothing has changed for you. The only negative in all this is that they aren’t adding new things to Classic moving forward. Like many have said, Basecamp Classic is there and will always be there for the foreseeable future. There isn’t much else anyone can do to make that sound better. We cheered when we heard the new Basecamp was out, no kidding. Headed right over to migrate our projects and saw – no time tracking? Alright, so for some the Basecamp Classic time tracking is a bit Spartan – but it does exactly what we need, no more and no less. We use it in conjunction with the TODO lists to assign tasks and automate our billing through FreshBooks. That duo is the single biggest driver for Basecamp at Synergy Codeworks, and we credit it for a lot of our growth. Please, oh god please, consider fast-tracking time tracking for the next release. Congratulations on what looks like a fantastic product and another successful release. We look forward to hopping on board! @Arik, I think that one of my related complaints or concerns is not that it is a v1, but that a clock started ticking from the time I cracked open the v1, and if the features are not available in 90 days, my costs just increased (should I decide to stay) and that if I decide not to stay, I am stuck in an effectively dead product line. I AM grateful that 37 Signals kept the legacy product alive for now, and that all of my projects, and workflow didn’t just vanish. However, since there is a 90 day clock to commit or quit, with no free version to keep me inside the ecosystem while it evolves, I have to take a look at my bigger picture needs in the meantime. While I understand that I am only a $99/month user, however at that rate, to add this v1 and maintain a second system, needing to evaluate each project to decide if it should use the classic or lite version of Basecamp, and needing to increase costs by 20% to do so, just isn’t the option best suited to me or my organization at this point. I do think that the new Lite version will likely bring in a wide group of smaller scale projects for which Basecamp was maybe too much. Can you paint another face on your Russian Doll? The front could have a calming smile, while the back could have a (private) knowing look. Thanks again for all the feedback. We have some great changes coming already today to the pricing structure that’s going to make it even easier and cheaper to continue to use Classic and Next together for a long time without paying double. Also, we’ve come up with a great design for dealing with the private items feature in a more comprehensive way. We’re really excited to get this implemented and out to everyone who were holding back because of the private items missing. Keep the feedback flowing. We have a lot of work ahead of us with the new Basecamp. It took us 8 years to build everything in Classic, so we can’t fix everything in the first few days after launch, but we are on it and we want to do everything we can to make the new Basecamp a fantastic choice for both existing and new customers. +1 on the lack of time tracking. The beautiful UI doesn’t make up for removing this one feature. Furthermore, since Basecamp’s simple time tracking tool worked enough for our business, we never bothered to look into alternatives. Now that they pulled this feature, we’re opening our eyes to other solutions that would completely replace Basecamp. @Arik, I’m not berating anyone. Half of my last post was quotes by other people in this thread. To the contrary, I’ve indicated MULTIPLE times that I love 37signals. However, it’s not unreasonable for me or other paying customers to ask for features that we like in the NEW version of Basecamp and to ask questions so we can plan accordingly. My experience with product launches and upgrades-and I have been on the core team for numerous ones-is that features are only added back in when enough people ask for them. Re: Classic and “nothing has changed for you”—you’re right that nothing has changed TODAY. However, that’s not really going to be true for very long, and we need to do some planning for the remainder of 2012 and beyond ASAP. You have absolutely no idea how this will impact my business or anyone else’s business, so please don’t make any assumptions about how this will impact people. Here at my agency, we have numerous other systems, processes and documentation that are dependent upon Basecamp Classic, so we need to proactively plan if that product is going to be stagnant or if/when we’re going to migrate to NEXT. The legacy version may exist indefinitely in a silo, but it won’t be in active development—meaning that it won’t be enhanced or the focus of any new R&D, nor will most bugs or technical issues be fixed. Eventually, it will be the equivalent to using Microsoft 2003 in 2012. Clearly your Basecamp requirements are not the same as ours, and that doesn’t make either one of us wrong. Just different. A few other posters have voiced the same concerns as me, so I think it would be best if we just agree to disagree on a few things. @37signals—thank you, thank you, thank you for your update! Can’t wait to hear more about the private items capabilities. Definitely let us know if you become aware of any time tracking alternatives (other than Harvest) too. Thanks! I’m confident they will make this right. Lets face it. As much as we all love BaseCamp Classic, it is showing it’s age. And it has serious problems. I still have clients that do not access it, because it is too complex. I’ve always thought that was strange, but could not argue with reality. This had to happen if 37 is going to maintain their lead in the project management area. The UI is great, but missing complete core functions – basecamp is becoming a nice system for home/family use – but for most businesses that want to keep track of all the aspects of a project its unusable. Mostly what I dont understand is that you propose to people to use more systems than one. (i.e. use a different system for keeping track of hours). This is against all “efficient work” rules. I would recommend you allow people customize at least some parts of their Basecamp if you are worried that for some it is a overkill. 37signals has prolific customer service so I know all these comments won’t fall on deaf ears and they’ve all been very constructive. This is a transition that all companies have to make to stay competitive and I applaud them for taking this courageous step with a product that made them famous. There are things that will prevent me from making the immediate switch over but I will as soon as I feel comfortable doing so. DHH, are there plans to make the New Basecamp mobile friendly in the next year? JHeflin, yeah, we really want to do a great job on mobile. We use iPhones and iPads and such on the go as much as anyone. I think what is most frustrating is that its one thing to simply say, “we weren’t doing time tracking right” when really, it was the predominant reason that users switched from the 25$/mo plan to the 50$/mo plan. You can’t just eliminate the MAIN feature bonus from your upper tier plans. But secondly, if you knew you couldn’t do it, why not atleast fasttrack the API so your third party vendors who so prolifically promote time tracking could atleast support it? Enough with the positivity about both products. Each product is half of a whole. Together they make the perfect basecamp. Separately, both fail on particular aspects. You didn’t upgrade basecamp, you created a DIFFERENT product altogether. Otherwise, more features would have stayed. If you are really paying attention, all anyone is asking is for you to admit the overlook on time tracking and that you’re roadmapping it for …... when? That’s it. Please do so. I’ve NO doubt its the topic of internal conversations. Hi Jason, David and 37ers. being excited about UI and speed of BCX we miss timetracking extremely. It challenged our creativity how to continue with timetracking with BCX but we would like to proceed as follows: - We run about 80 projects in BCX - We will create 10 special time tracking projects (alphabetical ordered) in classic, containing only the timetracking enabled todo lists. - as we do timetracking via TIMY, our team will not see any difference - we will have to run classic in parallel only for timetracking reasons and I hope Jason, you will not charge us double! I use the Free plan for my website. It’s a hobby and a not-for-profit site. 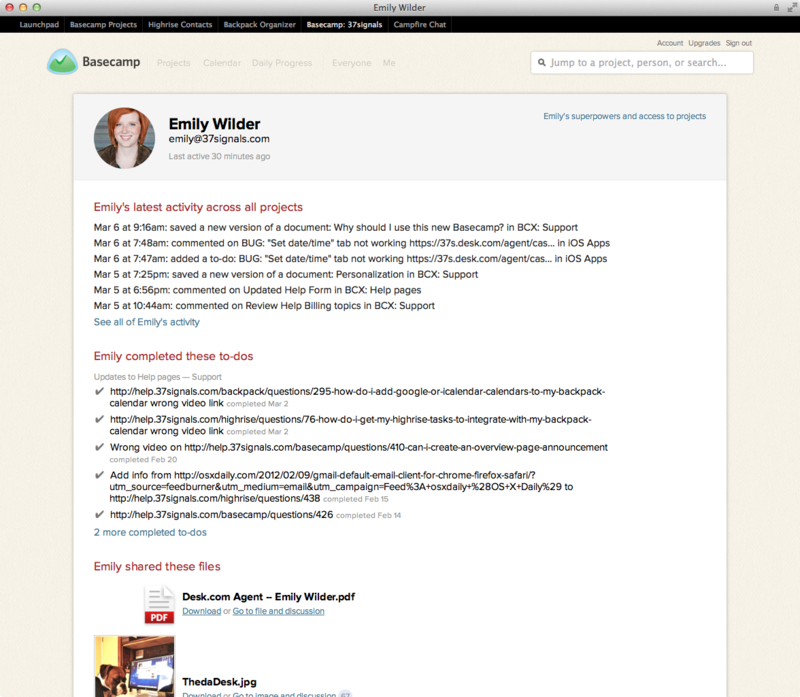 Every so often when I do something significant to do it’s nice to have something like Basecamp to use. I was looking forward to continuing this with the new Basecamp, but alas, no free version. I don’t just want something for free. That sense of entitlement exists all too much these days. But… please keep in mind that your fan base, the people that read your blog, read your book, tell everyone about your company, products, approach, methods, etc. might not have a budget for even $20 per month. But they’re still an important part of the 37 Signals. Reading the reviews, am I the only one who thinks this release is a total botch job? Todo handling is much improved. I especially like that I don’t have to explicitly “edit” a todo to assign an owner or date if it is initially entered undated or unassigned. Writeboards are now “text files,” and there is kind of WYSWG formatting. There is a bad to this as well, see below. Navigating in Basecamp has never been easy, often requiring a lot of hunting and pecking until you get used to it. But the new basecamp is much worse. When I’m in my todo lists (where I spend most of my time), and I need to jump to files, where is the link? How about jumping to discussions? No link. Oh, wait, that project title is a link (though it doesn’t look like it), which gets me back to the overview page, which has a link to those other pages. Very confusing. The text files (no longer Writeboards) seems like a step up, WSIWG, kind of. Well except that I no longer have access to the full Textile markup language, cannot do hierichial bullets, font colors, or hyper links. I’ve been implementing various rich text editors in web pages for more than 6 years, and most of them (check out options in Wordpress for example) do this kind of thing well, while Basecamp gets first grade level formatting. Todo comments are one place where Basecamp had a great opportunity for improvement. I’d love to be able to hover over a comment, and see the comments pop-up. Can I do this now? No, I have to go to a different page to see them. Popups would be so simple, so useful, but they are so missing. Speaking of comments, when I want to add a comment, I’m forwarded to another page. Fine. But where is the back button which takes me to the todo which I was working on? Not there. And where are the project settings? No, I really don’t want every comment to be emailed to the responsible party. I’d like to change that. I could in the old basecamp. I’d also really like to enter the project at the todo list. I think I’ve hit every link and button, and cannot find project settings. One final gripe from the hour I poked around. In the Basecamp menu at the top, when I select “Me” I get a view of my stuff. Cool. So when I click on “Everyone” I should see everyone’s todos, right, it is the logical thing no? No, I get a page of oversized pictures of people. And what’s with the photos in circles? Trying to follow Apple’s latest (and absurd) styling? I don’t know many people who put round windows in their homes, why do I need them on my project page. It results in a lot of wasted space on limited real estate, sometimes referred to as chart chunk. And why cannot I resize them, shrink them. Actually, what I really want to see is the list of people and thier permissions like I can in classic, but couldn’t find how to see all those. I use Basecamp because it is reasonably priced (by project not user), I have a lot of low tech users who seem happy with the todo list paradigm. But there is a lot missing, and if it were not for resistance to change by my biggest client, I would have moved on some time ago. I don’t mind eye candy, so long as it doesn’t come a the expense of real functionality. For exampel, why cannot I clone a project? I’d love to be able to sort by date or by who, or by who by date. I’d love to be able to edit todos in a table format. Todo lists are fine for 50 todos, but become cumbersom with 800+ items. I’d like to be able to export to a spreadsheet. Even better, I’d love to be able to import from a spreadsheet (even better than cloning a project). I could go on with things which would have been useful in terms of work flow and project managemetn. Sadly, we get eye candy and little functionality. For now, I’ll stick with classic. Less eye candy, more functionality. It is too lite on features to serve my present client needs. My priorities: 1. Templates 2. Re-orderable to-do list items. 3. Re-orderable to-do lists. 4. Private items. 5. HTML in to-do list items. This let me build visually attractive project start up lists for my clients and link to related training materials. I brought my sample project back to life in Classic and will keep it there for a while. I’ll check back every month or so until BCX is ready to server client needs. Version 1 of BCX looks like a really powerful tool for communications in the development of BCX. Those developers and beta testers are knowledgeable folks. Now it needs to round out features to enable other kinds of communications with clients at varying levels of skill. Jason – I can understand dropping time tracking from basecamp itself given that there are so many 3d party apps for doing that. And I understand the less is more philosophy and every feature having to fight its way onto the new version but dropping time tracking altogether??? Time is too precious for agencies for you to not enable us to more easily track and report. I really love the new interface. I think it’s awesome and I’d like to stay with it. I’d hate to have to switch back to the old version when there are so many aspects of the new version that I like more – most especially look and feel. Can you meet us half way by at least offering API integration with 3d parties like toggl, freshbooks, etc…? Larry, you can reorder both todo items and lists by clicking and holding on the text of the item or list itself and then dragging around. @LarryN For your #2 and #3 you can re-order the to-do lists and to-do list items in the new Basecamp. Just click a list or an item in the list and drag it up or down. My needs are more modest than most as I’ve been working on projects “as a shop of one/single business owner”—so private posting and time tracking has not been a need. I understand it is critical for others. My #1 hope is having tagging to help categorize documents. I work with a TON of documents for each project and it’s not so easy searching them out w/o some sort of categorization scheme, and tagging would be preferred. I hope this is on the road map within the next few months. I’ve been using an App that integrates with my old basecamp account, so I’m going to check to see if the developers have an ETA when they will have a new version that supports the new basecamp that I’ve gone ahead and migrated to already. Just want to know something about the feature for my clients see the interphase in their language, this and the templates where key elements to me. Please let us know something about this. ...did you just announce that private items are coming to new Basecamp? If so…wow. Just WOW! Or did I misread? We have some great changes coming already today to the pricing structure that’s going to make it even easier and cheaper to continue to use Classic and Next together for a long time without paying double. Great article :) 205 comments and counting!! Thanks Jeff – that is a really excellent deal. I don’t understand the transition pricing. I have Basecamp Classic Basic plan. When I convert to the (new) Basecamp 10 Project plan, how and why would I keep my Classic/Suite account open? Will is be Classic account with no plan? You’re not saying I’d have both the Classic Basic Plan and also will have the (new) Basecamp 10 Project plan, are you? Thanks for all the info on Basecamp. Keep up the good work! Andrew, you read right. We’re working on a brand new and improved way to have real private messages (and todos and files and text documents!) on the new Basecamp. Everyone here is quite excited about getting it done and in the hands of ya’ll! Joe, this is only a special offer for people who are still unable to move over all their projects to the new Basecamp. This may be because they have active projects that they don’t want to disrupt or because they need features still only available in Classic. If the new Basecamp works great for you, there’s no reason to keep Classic around. Ah, yes. That makes sense. Thanks. My projects that I imported yesterday did in fact get their dates sorted out. But more projects I imported today after you wrote this are not sorted properly, still as of now. Also not getting responses from support—I suppose they’re swamped. Hopefully they’ll get our imported discussions sorted soon. The biggest disappointment for me is the formatting on the imported Writeboards and discussions that were previously formatted with Textile. I can understand ditching textile support, but you could have easily put the text through a textile processor on import and saved them with proper formatting. Instead, everything’s just mashed up textile text, with CRLFs gone. I also agree that the WYSIWIG editor is lame. How about formatting links? Inserting an image tag to get images inline? This is basic stuff for writing specs and requirements. That said, we’re moving ahead on the new version, because I’m counting on continued improvements in workflow and features on the new version, which we won’t have on Classic. Sorry, but this is mistake from a “startup” and you aren’t “startup” anymore. I think you should read more your own advices. @DHH Is there any possibility to beta test the API? Thank you for having the courage to change!! Speed = A+...very fast, feels like it resides on my local machine. Love the new UI, daily progress, everyone and me!! @DDH Are you using erb to display the views? Did the decision significantly affect the speed? Reading all the post it is clear that some people are very resistant to change! There is no way a major product update, regardless of the inclusion or exclusion of features, would have made them happy! I get their concern regarding their workflow in Basecamp and that why classic is still available. Are there some features I would like back, yes, but improvements and changes are coming, like someone said, classic is the result of over 8 years of development. I think those of us who are patient will be very happy with the upcoming changes. No one tool will ever work for everyone! Using basecamp is also a statement of how you work…I believe in a simple, clear and transparent work flow, that is Basecamp! I have done my due diligence and used several other project management tools… and I found my way back to basecamp. Great job to all those who worked so hard to deliver the new basecamp! Stay strong DDH and JF… I am sure you anticipate a fair amount of pushback! All the best! One thing I miss from Classic is that when new comments are made and are unread, the comments bubble color change to green. Now I don’t really know which conversations have new comments and which don’t (beside the time and number of comments in the circle on the right). Another thing is that “overdue” to-do’s do not change in any way, I mean on the screen they look the same as the rest. Could BCX tell us they are overdue? an slightly color change on the date label would be enough. I also see that you make now not use at all of the right column. If you want “the most important” stuff on one screen (or page) the other stuff in Classic on that column was also important. Our company resigned ourselves to not being able to upgrade when JF posted his “what’s included and what’s left out email”. So, I somewhat view this from an outside perspective, since BCX no longer really matters to us. Yet, what I find humerous is how smug company responses were to issues like Time tracking initially … “that may or may not be something we choose to offer in the future.” Or the beta-tester answer… “we have over 900 beta testers and they haven’t expressed that”. Now the Privacy issue seems to be something not considered fully and the “plan” seems to be having two separate projects. Do I smell a 5:30 work around that isn’t going to work out well? Don’t get me wrong, though. I don’t envy 37Signals position and I sure as hell couldn’t have done it better. It just seems a lot like the Apple FCP X release. Release, Pray, and Scramble. Unfortunately, the bloom is off the rose a bit. I just hope 37s have the traction to recover because i like most of their business philosophy. If they do, it will probably make for another great book. It’s beyond me how anyone wouldn’t want to use time tracking. How else do you invoice on an hourly level? Keep track of contractor performance (billable or not)? As someone who’s kept an eye on BC for quite sometime with only a real need now for full fledged project management, why would I continue to explore BC to potentially become a long term customer if there’s no foresight such as this? Keeping your product simple has been stressed by all the greats and this makes sense — murdering the most basic workflow feature of project management is terribly idiotic. @DHH: Great news on Private. I know from experience that 37s solution will be a great one. I guess you can’t tell us whether this will be weeks or months away? @DDH looks like you guys listened to our needs for privacy. Thanks for letting us know that its coming soon. An eta would be great but not necessary. Just knowing that privacy will be added to the new Basecamp is enough. I can be patient. I should be able to switch after its added. I do have a question. When I tested migrating one project and found out that all the private messages and to-do’s where not migrated I deleted the project in BCX. When privacy is added will it get all the private data upon migration? I Hope so. Thanks for listening to your customers. Intriguing questions, and believe me: I completely see everyone’s concerns. There are some key features lacking, and for a software product that isn’t cheap (nor expensive, by any means), we have a certain expectation that it will at the very least maintain its utility. Of course I’m a little worried about the likely fact that 37signals will cease any sort of innovation or improvement of the classic product that we know and love. However, I also have known for a very long time from reading 37signals other materials (books, blog) that they have never intended for Basecamp to become more and more complex. My guess is that in keeping with their core philosophy, someone said “Basecamp has reached critical mass. It’s time to innovate in a different way.” Honestly, I’m just happy that they didn’t do so in a way that completely left me in the dust! Time Tracking: Honestly, I see very little difference between Basecamp’s time tracking tool, and a simple spreadsheet in, say, Google Docs. Sure, it’s integrated, but does it really provide that much more to me, functionally? Does it save my employees and contractors anything more than minuscule amounts of time to track time there, vs. somewhere else? More than likely, I’ll use the time tracking tool in Freshbooks, but if I wasn’t a Freshbooks customer, I feel that a spreadsheet could provide me the same utility as time tracking in Basecamp. Private Messages: I too utilize this…but I think this is one feature that I may be happy to see go in favor of the loop in feature. Why? Because one forces me to add a client or contractor or other department head to an entire project, then opt them out of items. Loop in will allow me to not force my client or whomever to be a part of the project, but I can instead opt them in to items. I have a feeling I’m going to like that better. A couple of the other items, I can’t work around. No integration with the suite, and someone mentioned above that there’s no way to import already-archived projects. Yeah, both things unfortunately make Basecamp Next prohibitive for me to use. My guess is that we’re all a part of a giant “gamma” phase. 37signals will continue to develop Basecamp Next until the majority of us have been satisfied and make the switch to Basecamp Next, or we are not satisfied and switch to someone else (for reference, check out 37signals’ book “REWORK“). @Mario: Your feedback is spot on and spookily exactly my ‘gripes’ about the all new BC. I’ve also sent a support email regarding the drag and drop of todo list items. We used this extensively for a visual order of priority for our team, and now everything new we add ends up at the bottom of the todo list. We have 30 in our team, a team always opened to trying new things I should add, however all but two have asked we switch back to classic. As you say Mario, maybe we’ve missed something, but I’d like to think we’re intuitive users, which suggests these features have been dropped from classic. The new transition pricing is a relief. Thanks. The speed and new UI are great but why delete some of the, for us, core features of BC: project and to-do templates? Anyone know of an alternative for project management? So much negativity here that I don’t understand. If some specific feature is a dealbreaker we can stay on Classic – as a major courtesy, we’re given 90 days of fully-featured testing of the new Basecamp to see if it would fit our needs (or maybe even just for some of the projects we’re doing). 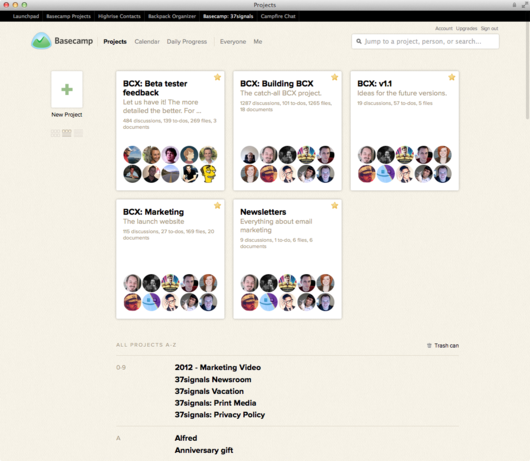 For the record, we love the new Basecamp and its shift of focus. As a customer since Classic launched, I know that 37signals will continue to improve the already great products they offer. Does this mean that for me as a Suite user I can use both products parallel? This would make sense for me, cause Suite means to use all available products together. This is not the quality and consumer-focused way of information policy that i used to experience in using your products for years. @Markus – I’m not really sure what they could do to make it any clearer? The $20 price tag is the real deal killer for me unfortunately. With a very unfavourable Dollar -> 3rd World Currency exchange rate I can imagine it will be too expensive for a lot of individuals (as opposed to companies) like myself who use Basecamp for personal projects. I’d love a cheaper option for say $5 which only allows 1 – 2 projects. 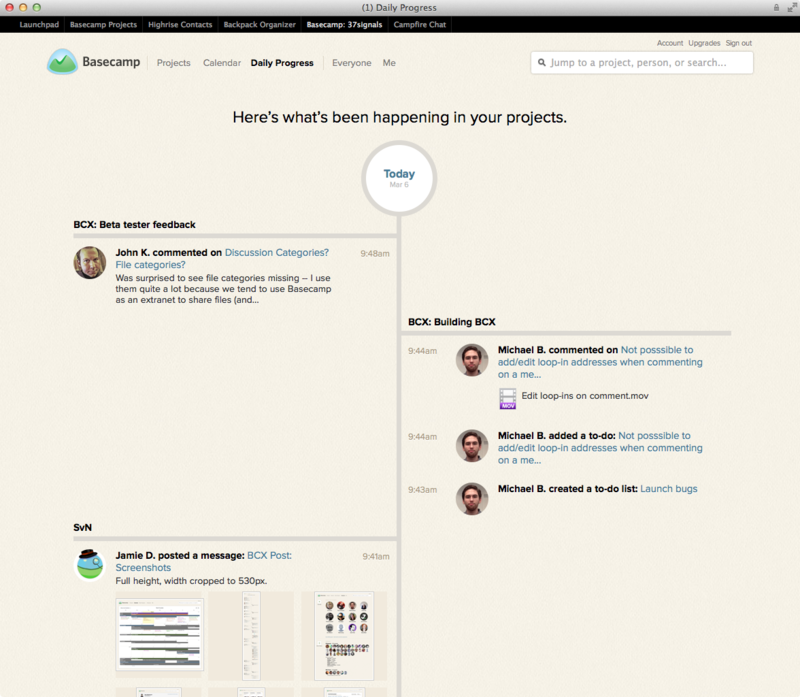 BaseCamp Classic has more than doubled my project management capacity. It literally allows us to do almost everything that we do, better. We spent a few days with the new product, and we all really wanted to like it. It does have some sweet features. No file Categories &/or Tagging – No file descriptions – No file sorting options – No File versioning – Projects are now enormous panels on the “projects” page – Cannot use text documents on iPad – Truncated To-Do lists - No Milestones – I like the ‘opt in’ idea, but not sure why cant it live along side of privatization. In general, this release feels incomplete. For those that use BC primarily as a discussion board and not as a file repository; for those that typically host a handful of small projects with short completion times and for those who’s entire project team has IE9 (excludes A LOT of large corporations) ... This version is for you! Markus, yes, you can use the suite and the new Basecamp at the same time. No extra cost. See the new transition pricing scheme. Steven, you can drag’n’drop to reorder todolists and todos. Just click and hold the name of a list or an item and drag it around. I like the idea of the new basecamp, simple, clean and fast. But it needs time to grow into something that can replace basecamp classic, so far it looks more like child. But what I don´t like the most is the new concept of comments. If I upload more images into post, it takes whole screen – previews and texts are big. Would be nice to have option to choose (big view, smaller view). In basecamp classic you could see more posts even if images were attached. In the new one I have to use browser page zoom out to be able get on better view. So in general all seems to be bigger in comparation to classic version. I will wait on more updates and then I hope I´ll be able to switch. You did great work but maybe you relased it too soon..
I’d like to test out BC Next by copying my projects over, but I’m worried that my clients will be automatically invited—I don’t want them to start using BC Next by accident until we’re ready. Can you confirm that after I copy the projects over, clients won’t get any invitation emails, and they won’t see any links to the login/access pages for BC Next when accessing our BC Classic projects? Even so I’d still be worried that our test projects will show up for them if they’re using BC Next for some other reason. I need BC speaking spanish. Please drop me a line when available to try. Clasic BC never got finished the spanish translation… sad. This new system looks great, however, with the lack of time tracking I simply cannot make the transition :( ... Many of our employees are expected to work 8 hr days across all available basecamp projects which must be recorded/monitored almost religiously. I understand that this is V1 of a new release, but I genuinely hope that V1.1 adds time tracking. Fingers crossed. It would also be tremendously useful as a manager to see everyone’s daily/weekly/monthly time totals across all projects or some kind of integration with the “Daily Progress” feature. Anywho. Basecamp is a great service and I look forward to seeing it continue to grow in the future. As far as I can see you can only reorder todolists and todos on the project pages but not on the me pages. This is the most important place as you work out what is most important to yourself over multiple projects. I get that for the sort of feature enhancements you guys probably have in mind for the future, you’d prefer to build on top of a brand new platform/code-base instead of shoe-horning the feature enhancements into the current version, only to have to rebuild everything all over again.That’s why I think you really should have waited to launch this until you had finished adding features that addressed requirements established by the old tool, or at least have called it a beta so that the rest of us didn’t feel so slighted. Ultimately, I feel like the quality of everyone’s frustrations are less about the specific feature changes and more about how you’re treating all of this. I mean, the HTML 5 innovations are fantastic. Truly. User Interface looks great. And the IA improvements are especially helpful. That being said, I’m very frustrated at having waited this long for some of these feature improvements-changes to things that, honestly, should have been done 2 years ago like changing the “Messages” to “Discussions”, adding the Backpack Calendar, adding user groups, or replacing Writeboards with the Text notes-only to have them accompanied with the removal of significant operation-impacting and workflow-impacting features (categorization, milestones, time tracking, privacy, project templates). It’s like when you updgraded the last version of the Calendar only to remove project labels on milestones for the dashboard view, thereby negating a huge portion of the calendar’s utility, all the while insisting that alt-text labels were a sufficient substitute—which you clearly didn’t really believe or else we wouldn’t have the calendar we now have. I get that I don’t have to switch over, and I appreciate that, but I’m still bummed I don’t get to adopt these new features, when you easily could have both anticipated and avoided/addressed this frustration. If you truly expect that we should be able to transition to the new site and still be able to perform our current operations, your launch messaging should have included more examples of how you could still use Basecamp for a variety of operations even without the same features. I personally don’t use the privacy feature that much as we don’t use the tool with outside clients, but it’s not enough to only say we replaced it with the opt-in, and the opt-in is better, and this is how opt-in works, without illustrating how to make that transition from how privacy was previously being used. It makes it seem as if you are unable to acknowledge the spectrum of user scenarios your product affords and it makes me mistrust the methodologies you preach when they don’t seem to contribute to how your own product is managed. If, as have been stated in the comments, you are going to be focusing on these sorts of issues, then that’s great, and I will be relieved and enthusiastic when it happens, but as I’ve said, all the more reason that this launch should not have been positioned as the primary product. It should have been a public beta until such a time as it was, at least, even with the user experience available on the current version. I share DW’s frustrations and feel he expressed those frustrations perfectly, yet respectfully. The fact that so many people have taken the time to voice their frustrations, indicates how successful Basecamp Classic has been to-date and how integral your (37signals’) products/services have become to many of our businesses (of all sizes). For this, you should be commended. With that in mind, without restating/listing the Classic functionality missing in BCX (to-date), that I use daily in Classic and feel should (unquestioningly) be carried forward to BCX, I say simply that I look forward to the time (soon I hope) when this functionality is incorporated into BCX so I can enthusiastically join those who have already been able to enjoy the fruits of your hard labour in creating BCX’s excellent and speedy new interface. Translation: Yes, I know I can continue to use Classic (thank you) – but I want to be able to use BCX so I can enjoy the obvious, and continuous, improvements without sacrificing what has become functionality essential to my company’s daily operations. But cannot we use TimeDoctor.com to track time? I heard TimeDoctor now has Basecamp integration. Absolutely AMAZING job! My business has taken on a higher professional feel than ever before. I cannot speak highly enough of the new site. You guys are incredible. Thanks so much for making a great product even better! Only issue we miss is the templates, as many of our projects have 30 or so similar steps. @Bence – Of course. There are a few tools out there that have Basecamp integration and have more robust time-tracking abilities. Whatever works best for you. For me (and it seems like quite a few others here), the Basecamp Classic time-tracking is simple yet effective and keeps everything nicely in one place/tool. It’s really great. Thank you! But, could you please give us the option to start week on Monday in Calendar instead Sunday? Wait… Where the the templates??? And the third party integrations? Just cutting out time tracking on a project managment system just seems crazy to me. There are things implemented which are cool but not critical as a project managmeent system. I have not seen one valid reason why Time tracking was left out yet. Just another reason us and I know many other companies are going to migrate. For anyone interested take a look at freedcamp. It is Free and set out to help address issues you have with basecamp and where it has been going over the last few years. It does not have any/many apps to work with it just yet so please help support and get app makers to support it. @37signals team, I honestly do not know how wrong you got this and how you think hardly anyone uses it since because it was not implemented far enough lots of people used 3rd party to post that time into basecamp. You may have made a mistake thinking not many did it in basecamp so was not needed. People ran time tracking apps etc to post in, that is how it was done. You just shooting yourselves in the foot and I really would have thought this was a no brainer out of the box. First: our whole office loves it. You’ve done a fantastic job, and you should all be proud. The look and feel are beautiful, functional, and flexible; everything works so fast; and it’s clear that a massive amount of detail-sweating went into this release. It’d be great if to-dos could make it onto the calendar. Time tracking isn’t a deal-breaker for us, but it would be nice to have at some point. We did use it, but aren’t gnawing our own wrists without it. Templates—we can haz? And I think the most obvious one for our shop—would it be possible to make the project list next to the calendar clickable, so we can get straight back to the project from the calendar page? Meanwhile, though, thanks for recreating Basecamp. We love it. project_imports is smooth. I’m 100% converted from basecamp classic. Whoever worked on that feature, take a bow. @Bence, thanks so much for the suggestion re: Time Doctor! It looks like it might be a good possibility for us if time tracking is not added back into Basecamp Next. Still bummed about the extra $79-149/month, but definitely adding it to our short list. To anyone else considering Time Doctor—so far, the only potential drawback that I can see with it is that I’m pretty sure it would be compatible with Basecamp CLASSIC, not necessarily Basecamp Next (since the API for Basecamp Next has not even been released yet). I will check with Time Doctor about that, though, and will report back here if/when I get an answer from them re: Basecamp Next integration. I’ve already checked with five other developers of third-party apps that we are currently using with Basecamp Classic (PlannerX, Safobudget, Know, Blueprint and Trailmap) and so far all of them have said that they have not been given access to the new API so none of their tools will work with Next yet. I don’t know about Project Recon, which is a desktop app that we’re currently using that is tied to Basecamp Classic’s time tracking feature. I imagine in another few months some of these developers will release new versions compatible with Next, after the new API is released by 37signals. Anyone out there aware of other reasonably-priced time-tracking apps that are designed for teams (ideally less than $100/month or flat fee)? If they’re compatible with Quickbooks Online and have been compatible with Basecamp Classic to date, even better. I want to explore 1-2 additional time tracking tools during the next month or two in case Project Recon and Time Doctor do not pan out. Thanks in advance. We were previously looking into creating our own internal app to sync Basecamp Classic to Quickbooks Online, but I have told my team to stop working on that for now. If anyone out there is aware of anything that is less expensive than Time Doctor and syncs with both Basecamp NEXT and QBO, I’d love to hear about it. Thanks again! The one thing that I’m going to check about is whether Time Doctor will be compatible with the NEW version of Basecamp, though. 37signals is creating a new API, so any third-party apps that were compatible with Classic may not be compatible with NEXT. Oops! Was typing my last post in Notepad in between meetings throughout the day, and I accidentally included some “extra” stuff (earlier comments that I then rewrote) at the bottom. Sorry about that! The two most discussed features here have been by far the lack of “Privacy” and “Time Tracking” in BCX. One could say that if these two features would have already been implemented in BCX from the very first beginning, this thread wouldn’t have been that long for sure and the tone & demands would have probably been quite different. I don’t know what are the statistics but to be able to use Time Tracking on Classic you need to be at least on the $49 plan. The thing is how many users are on the $24 plan or under and how many are in $49 plan and above. I read a comment here that seems to be important about it, and it seems as an indication to me that the most important loyal and use intensive companies using Classic for years are among the ones who most use this feature. And it also seems to me that 37signals may have only considered the amount of user base for the Time Tracking feature but not the importance of this user base. Companies with hundreds or thousands of projects using basecamp for years and doing work of mouth attracting other users to use the tool they are using and learn to love, basecamp. Of course there are more “solo” or “freelance” users as “companies” using basecamp but driving your business decisions just base on numbers and not and the souls beside those numbers, is ignoring completely the people who have supported you using basecamp for many years trusting you on a working model which you gave and supported and then suddenly you start saying, forget about it, we will give you a new model. Apple is an example of this kind of decisions making. Most people know here the Final Cut Studio sudden end of development episode after letting companies investing thousands of dollars in that product platform just months before and then letting thousands of companies wondering if Apple was the company to work with in the feature, a company who care most about building iphone and ipads that caring about professionals. With so those million users in your accounts, the lack of Time Tracking feature may not have an impact in your business directly but loosing the hurt of your most loyal and professional users who have different needs as the rest of users may have a different kind of impact on the long run. It seems contradictory that new companies are now emerging offering Time Tracking as their only product and it seems they make good money with it and then you just say this feature has no future on our business. I would say make Time Tracking feature available for all plans and let’s see if it has future or not, I would bet the hell it does have a future. And your most loyal companies will thank you for that, because as you see they want to work with you and not with someone else, and that is what your numbers and statistics do not show, mainly: the soul of those users which love your product and supported you all these years. For those curious about time tracking, templates, and private items in the new Basecamp, see this page. From the looks of things, maybe you should have spent more time on the functionality people actually need rather then circular profile pictures. Has your world shifted so far from real client work that you lost sight of what people need from a project management tool? I’ve used BC for a very long time and always liked using it. The things you implemented in the new release are amazing in a technical sense, but they’re not a step forward in a usability sense if they don’t allow users to complete the task efficiently, effectively and completely. How much user testing and persona research did you do before you decided on the feature set for the new site? I never used time tracking (use Harvest) mainly because it just didn’t work very well. I’m not going to miss it, but you should have improved it rather than cut it. The Classic version was a few steps away from being perfect for me. The new version is much further. No doubt it is a giant leap forward in many ways, but it missed the mark in many others. The lesson I’ve learned here is how customers react to what they want and do not have. Customers will pay much more attention to what you take from them instead of what you give them, even if you think what you offer them is nicer as what you take from them as far as what you give them does not solve what you took from them. And most of this thread here is a kind fight showing these two sides of the same coin. My feeling about it is that @37signals has aknowledge this situation and has reacted to it, writing that they are considering this threads and customer feedback and has learnt from this reaction from customers, which is mainly, I guess, why they have lanched the product in this state, I guess they wanted to hear what customers has to say to it, so that they can adjust the product roadmap from the feedback they get. I hope it all goes to a happy end. New basecamp rocks our world. Been using basecamp since 2005, and it’s been great. Thanks to all who worked on it. Thanks also for responding so quickly to the users who need more features. I’ll have to check this one out definitely. Basecamp always seems like something I could actually put to use but never give myself the time to try it! All new Basecamp might not have some important features for many, but what is implemented there is done really great. It took 37signals a year to do that. Most of people complaining here have 90 days free trial of the all new Basecamp, which is 1/4 of the time needed to build the all new Basecamp from scratch. So imagine how much more can be delivered until your trial will end. 37signals made a call, they built the new Basecamp from scratch. They also made a call to launch the new Basecamp within a year from starting building it. They had to make calls to give up for now on some features to make it possible for the new Basecamp to launch and be available for so many potentially happy customers. They have valuable feedback quickly now and based on that they can make further calls. You have to be brave to make such calls. Full respect for you in 37signals. As we say in Polish: “pełen szacun”. Many times David and Jason mentioned that speed of the application is the one requirement which will never change, ever. They focused well on that. Having that they can build next features knowing that the speed of using the new Basecamp is intact. It is so great that the new Basecamp has been already launched. Tough calls had to be made to make it possible, but here we have it. With SaaS model things like bad sorting could be fixed in no time. If 37signals can do the business like that without time tracking, I want to know how they do that. I would rather learn this way of working than keep requesting the time tracking tool being implemented in the new Basecamp. It would be such a relief to stop tracking the time at work. It gives me hope seeing it is possible in the real world. I would like to buy training from 37signals which would show me how to work without tracking time. Have you all ever calculated how much time you spent on tracking time at work? I’ve been working in places where it took at least 20% of working time. It is 1 day a week! Such time could be spent on creativity. And how much you have to train people so they do track the working time is enormous. So give up on time tracking (37signals might help with how to do it) and have some life. Read that book, it will help your frustration go away and you will be happy. @37signals—thank you for the “Why didn’t some features…” page. I know that this has been a pretty rough week for you guys. I don’t personally have good sense for what percentage of 37signals’ customer base offers services vs. products, but this outlook sort of jives with some of the comments in the “Why didn’t some of the features…” page. However, I’m glad that so many of their customers who ARE still billing clients on a time-and-materials basis have chosen to speak up that we are not all moving in that direction. I agree with some of the previous posters who mentioned that focus groups, user testing and user personas are critical. And, in my experience, it’s far less painful for all involved if there is a certain level of transparency re: the findings and rationale behind design decisions. Not full disclosure necessarily, but just open communication and proactive expectation setting for current users. Unless 37signals doesn’t really WANT to focus on professional services clients anymore and that’s why all of those features were removed, LOL. Or if we are in the minority and are not all that profitable for 37signals, that would be really helpful to know too. As I have mentioned a bunch of times above, I am still a big 37signals fan. Thank you for listening to us and for re-evaluating some of these critical features. I know that all of us at my company would prefer to continue working with future versions of Basecamp if possible. Anytime you release a redesign, prepare for a flood of angry email from customers. It’s a law of nature that users hate change, and they’ll complain every time you move anything around or otherwise reduce their ability to just do what they’ve always done. I agree wholeheartedly and we (a professional consulting/services firm) also hope to continue working with future versions of Basecamp. thanks for listening about private messages – for anyone in a client-services business it’s essential. I think the key oversight on your part is that you’re an internal product company so all your communications are inherently open and periodically you’ll have to loop someone outside in on something specific – thus the loop-in feature makes sense. For people who use basecamp as a communications and management tool for client projects where the client is sharing information with you, both companies really need unfettered access to the workspace but we still need to be able to have our own lists privately to review things before releasing them to the ‘public’ side which the client can see. doing that in two completely separate projects is pretty unworkable (at least as how Basecamp is currently designed) since we’d have to duplicate everything we want to share. Looking at the new pricing, one thing stood out for me. You used to charge prices ending in 9 ($49 for my current account) and the new relatively matching price point ends in a 0 ($50). While this seems more honest, I know there’s endless reams of psychological research about those *9 numbers, how they silently improve conversion rates. Did you do any A/B testing around this point? Any conclusions you’d like to share? Can you migrate some projects and leave others in Classic? After a few days with the new Basecamp, we are loving the Daily Progress. It is way better than the Dashboard was, and that was pretty useful. Nice work! This should be the default view when we log on, like it that much. Did not mean to post that as anonymous coward. Been a LONG time user. I know that you’ve said that templates are coming soon, but I wanted to underscore how important they are to users like me who have a lot of projects that contain identical phases. We do a lot of website setups that require long checklists and we need those to be the same every time. Add templates is vital and until they’re added we’re going to create projects in classic and import them into the new Basecamp. Writeboards replaced by text documents and the ability to track versions abandoned? Really? Doesn’t anyone else need to be able to review and evaluate changes? Does everyone else just do group editing destructively? We won’t be able to live without this and don’t want to have to rely on stand-alone Writeboards. This is a definite deal breaker for us. Unless I see a promise to keep Classic permanently or reintroduce version tracking, I have to leave. Also, leaving out time tracking because so few users were using it is like MacDonalds eliminating coffee because so few customers were drinking it. Instead, they realized that their coffee blew and replaced it with something closer to what people actually want to buy. 37s: if you don’t understand time-tracking needs, you’re clearly not listening very carefully. Meanwhile, this seems to be a move away from integration rather than toward it. The new Basecamp doesn’t integrate with the Suite (at the moment), never mind with Dropbox or Google Docs. My users are unhappy having so many tools and its not clear the new Basecamp will be other-friendly enough to handle enough functions to justify the mindshare buy-in. With the ongoing promise of no roadmaps, I won’t be able to predict if things are likely to move in a direction that would better suit my needs, so I’m demotivated to stay tuned. Any feedback on linking won deals in highrise to new projects in BCX? I liked that feature as we have lots of smaller projects and it saved tremendously on double entry. Also noticing that when inviting new people to projects it still will not reference contact / company information from Highrise (same behavior as before). Will there be any work for further integration with the current “suite” tools or is everything on hold for Next? Highrise Next tentative date? I import Google Charts into the Overview page on Basecamp classic, with HTML. Any chance you will allow people to add HTML to the Overview page in the new version? Other than that, I love the update – especially the calendar colour coding. As it seems inevitable that you’ll eventually be phasing classic out I’ll be keeping my eyes peeled for updates to the new version! Our group was considering the suite. Frankly, the roll out made it possible for everyone to test Basecamp features, turning a maybe into a big no. I’m sure you guys are working hard but this doesn’t deliver the two most important features we need to support our small, international, typically asynchronous environment. (1) Cross project overview. You have promised (above) that these views are coming, but with them, we felt you’d taken the “management” out of project management. (2) Effective todo assignments. We need the ability to assign specific todos to groups that are a subset of the whole team. Because Basecamp doesn’t support this, our folks found the “My” page wasn’t helpful. Instead, they had to be assigned to all the projects and then review all the todos of all the lists of all th projects—effectively, they had to discover their real todo list. As well, they are being bombarded with emails about todos and/or discussions they shouldn’t need to be bothered on. (3) Unable to integrate todo into the calendar. Lack of ability to begin with an event and work back to a todo item/list or project. The takeaway via twitter from JF was that at the basic plan, taking away fully 1/3 of the project limits from this plan, and dropping the price by a mere $4.95, was due to customer input. I have to say that I’m really bummed. I’ve been testing out BC to great success, and upon seeing the new UI and features, got really excited. Then saw that I’d either have to lose four of my projects to get to the under 10 limit that WAS 15 in classic, or double what I paid each month. As a small biz, I didn’t budget for $600/year for this tool. I have read Jason’s book, re:work, and have defended BC for some time when people complained, but the pricing model at the basic level is contradictory to not just the theme of the book, but it’s also hurts your current customers who might be at 12 projects. Why not allow them to be grandfathered in? You certainly went to great lengths to create this odd “upgrade” grid for current customers, surely allowing this would be equally nice to see? One thing I am confused about, and cannot find on the site anywhere—what are the storage limits for the New Basecamp? The pricing structure seems a little different—I’d like to understand exactly what the difference is in pricing and features please. Thank you. The all new basecamp introduces unprecedented speed and ease of use – no doubt about it and kudos to the 37signals team. There is no way to see all To-Dos on one page. The calendar view for To-Dos which was announced to be practically around the corner shortly after the introduction of due dates more than two years ago would have served that purpose perfectly. I don’t understand why the “best calendar of all times” has been dumbed down so blatantly! This strongly contradicts the “big picture” Jason F. relentlessly underscores in the introductory video. I’m sure I’m not the only one who needs to see what’s on everybody’s plate on one page and shuffle things around. Workload balancing is key to quality. So instead of chickening out and giving in to the rambunctious minority of time trackers (and I totally agree with you: BC never was a great time tracking tool, so it’s good you kicked it) I’d consider it more important, getting the core values “Big picture easily drilled down” of the all new BC straight. All new BC is a really good product – make it great by adding calendar view for To-Dos. Please! Holy Crap Jason you guys have had a rough 7days. We are not complaining at all. We totally understand new things and clients complaining. I think it would be helpful for everyone to place themselves in your team’s shoes. Hello, we have 90 days to figure the new way out our go back to the old way. We are liking the new way. We are just confused when it comes to pricing. We are a full 37signals suite customer. We are trying to understand what our bill will look like with this new version (if we drop the classic). Would we get billed separately for new basecamp then a bill for highrise/backpack/campfire? That is all. Obviously no rush to get the answer—-since we have 85 days left. Well, I guess the great thing about this new basecamp and all of the comments….we will probably get to read re-work 2.0 in the near future. Thank you 37signals for making our business workflow move with ease. I love you guys, but I love your product more. After using this thing for the past week, I’m about ready to say it’s my favorite thing to ever exist on a computer. And it’s making me ridiculously productive and on-top of my workload. If you liked this Business post by Jason Fried, you’ll probably like reading My door is always open... Whatever., Link: Why we're building a whole new Basecamp, and Sortfolio deserves a better home. Make us an offer.